1. Select the job to stop from the Vectorize/Render Queue window and click Delete. 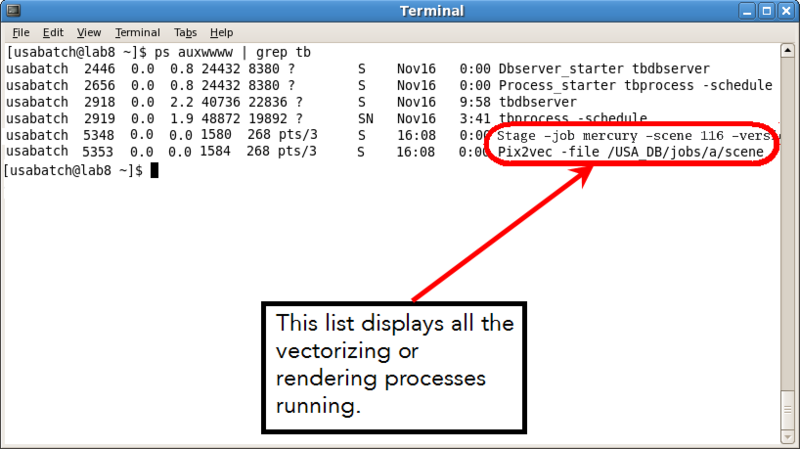 ‣ If you started a vectorizing process, look for the process that lists the word Pix2vec -file fileLocation. ‣ If you started a rendering process, look for the process that lists the word Stage -job jobName -scene sceneName -version versionNumber. ‣ kill -9 5353: Stops the vectorize process. ‣ kill -9 5348: Stops the rendering process. If you stop a process, but do not delete the job from the Vectorize or Render queue, the queue marks the entry as in error (Pending-E) and the entry stays in the queue. This is why it is important to remove the entry from the queue before you stop the process.